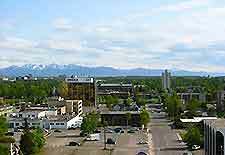 With an important history of oil, Anchorage is now very much a major tourist destination, offering a range of affordable hotels and accommodation. Hotels in Anchorage are often well-placed, with superb views of the surrounding mountainous scenery. Attracting more than one million visitors to the Anchorage area every year, the city's hotels can become extremely busy. Alaska's peak tourism season is during the summers months of June, July and August, when it is advisable to reserve hotel rooms well in advance, often several months. Also of note, the demand for local lodging noticeably increases in January and February, being influenced by the annual Folk Festival and Fur Rendezvous Festival (Fur Rondy) respectively. 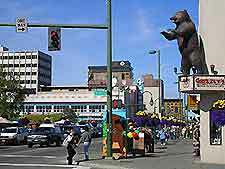 Hotels in downtown Anchorage are all within walking distance of major tourist attractions, shops and restaurants. Popular hotels in the downtown district include the Captain Cook, the Hilton and the Marriott, all of which offer modern facilities and amenities. 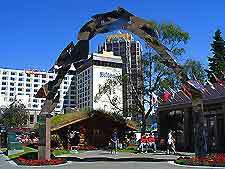 Midtown Anchorage is another popular area to stay and contains a number of notable lodging opportunities, including both the Hampton Inn and Residence Inn by Marriott. South Anchorage is where you will find more intimate guest houses and is a mainly residential area, with a multitude of woodland trails nearby. Muldoon, on the eastern side of the city, is also home to a good selection of bed and breakfast options and small hotels. 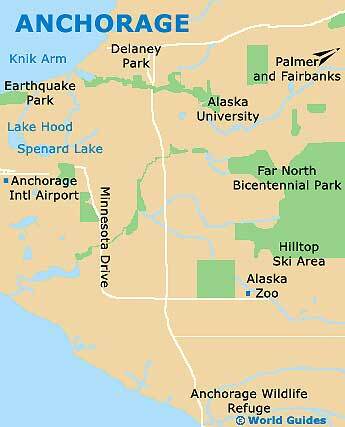 Further hotels can be found next to the Ted Stevens Anchorage International Airport (ANC), which is situated just 6 miles / 10 km from the city, close to the scenic Lake Spenard. Popular hotels in this part of the city include the Holiday Inn Express and the Courtyard by Marriott, both of which are ideal for business travelers. Also, just a short drive from Anchorage, the neighboring town of Girdwood provides additional accommodation and many chain hotels in close proximity to ski resorts, such as the Alyeska Prince Hotel. Wasilla, just a 45-minute drive from Anchorage, is another popular destination and includes the shoreline Best Western Lake Lucille. Some of the cheapest hotels and motels in Anchorage can be found along Abbott Road, East 5th Avenue, East and West 8th Avenue, Minnesota Drive, Northwood Drive and Spenard Road. Muldoon Road is a particularly popular spot for overnight accommodation, acting as a bypass for travelers heading north and south. Also, campsites and RV (Recreational Vehicle) parks on the outskirts of Anchorage offer one of the cheapest places to stay in the region, including motels, mobile homes, caravans and tent pitches. One such option is the Centennial Park Campground on the Glenn Highway. Many of the main mid-range and luxury hotels in Anchorage can be found along Aspen Drive, East and West 3rd Avenues, K Street, Spenard Road, West 5th Avenue and West 7th Avenue. These locations feature a large selection of the city's major chains, such as the Courtyard, Fairfield, Ramada, Sheraton and Homewood Suites hotels.